President Paul Kagame on a panel with Jack Ma (R), on left is moderator, Zanny Minton Beddoes. President Paul Kagame has said that the African continent can no longer continue to delegate responsibility for its growth and development to external parties. 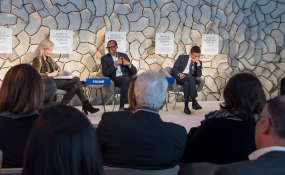 Kagame was addressing African Heads of State on Shaping Africa's Agenda in the Global Context in Davos, Switzerland at the ongoing World Economic Forum Annual Meeting. He said that more than ever, conditions are ideal to change the status quo and take lead in shaping Africa's future bringing to end dependence on external actors who often benefit more than the people of the continent. "The conditions have never been so favourable for Africa to take the lead in shaping its own global agenda. For too long, we ceded responsibility for Africa's agenda to others, with some individuals even benefitting," Kagame said. Delegates follow one of the sessions at the WEF 2019 meeting in Davos yesterday. Village Urugwiro. "Challenges relating to migration, security and climate change among others mean there is no longer any actor who sees an advantage in an Africa that is institutionally weak and economically stagnant," he said. "Everyone benefits from a stronger, more united Africa. This is reflected in the more constructive tone of Africa's partnerships with China, Europe and others. But no one is going to transform Africa on our behalf. It is up to us," he added. He, however, said that there is notable improvement in the pace and quality of integration through aspects such as African Continental Free Trade Area Agreement as well as the protocol of free movement of people. "Last year, for example, the African Continental Free Trade Agreement was adopted and it is likely to come into force this year. We also agreed on a timetable for the free movement of people and on the establishment of a single African air transport market," he said. In the coming African Union Summit scheduled for February this year, the Heads of State and Government will consider a proposal to harmonise digital identity platforms across Africa, with common technical standards and data protection norms. All these initiatives he said are aimed at bringing all Africans into productive, knowledge-based economic activity. "This is an example of how Africa can work together to prepare for the Fourth Industrial Revolution. This dynamism is consequential for the future. After all, it is no easy matter to forge consensus in a union composed of more than 50 countries and several interlocking regional economic communities," Kagame said. Emphasising on the importance of international cooperation, Kagame said the African continent also ought to adopt a posture of active responsibility toward shaping its place in the world. Other requirements for the way forward, he said include strategic leadership and investment from the private sector particularly in terms of technology and industrialisation. Kagame later featured on a panel session on closing the financing gap alongside Managing Director of the International Monetary Fund Christine Lagarde; musician and activist, Bono; Bill McGlashan of TPG Growth and Afsaneh Beschloss of Rockreeck. "It is a special, exciting partnership that brings marginalised people in society to connect directly with the consumers. It has democratized benefits. If you look at number of people who will benefit, young entrepreneurs, farmers involved in coffee businesses, it is all inclusive," Kagame said. "My reason for being in politics is to enable business people to do business and succeed," he added.